Article II, Section 1, Clause 5 provides: “No person except a natural born Citizen, or a Citizen of the United States, at the time of the Adoption of this Constitution shall be eligible to the Office of President; neither shall any person be eligible to that Office who shall not have attained to the Age of thirty five Years, and been fourteen Years a resident within the United States.” This eligibility requirement raises the issue of whether putative President is a “natural born Citizen” thereunder so as to make him eligible to be President. But what is a “natural born Citizen?” There is a wealth of information which informs us on what the exact definition is of a “natural born Citizen.” I have included this information in a brief that I wrote and which Attorney Karen Keifer filed with the Commonwealth Court of Pennsylvania in the case of In Re: Barack Hussein Obama, II et al Objection of : Charles F. Kerchner, Jr. and Dale A. Laudenslager. That brief may be read at http://www.scribd.com/doc/83104811/Kerchner-Laudenslager-v-Obama-Ballot-Challenge-Brief-on-Behalf-of-Objectors-Filed-28Feb2012. Here I will only highlight a part of the brief which Obama’s supporters do not want the public to read. To correctly understand what the Founders, Framers, and Minor meant by birth to citizen parents, we have to understand that at the time that the Framers drafted and adopted the Constitution and when the U.S. Supreme Court decided Minor in 1875, an alien woman automatically became a U.S. citizen by marrying a U.S. citizen. When parents became U.S. citizens, so did their children, no matter where born. Naturalization records for both alien women and children are virtually non-existing because of this derivative naturalization. http://www.archives.gov/publications/prologue/1998/summer/women-and-naturalization-1.html. What is critical to understand in this connection is that Congress before 1922, to avoid dual allegiance and nationality, had caused American-born women, “of perhaps Mayflower ancestry, whose forebears fought through the Revolution, and whose family names bear honor and conspicuous places in our history, who are thoroughly American at heart, and perhaps who have never left these shores” to forfeit their American citizenship upon marrying an alien husband. (http://www.archives.gov/publications/prologue/1998/summer/women-and-naturalization-2.html. generally held that the alien wife of an alien husband could not herself be naturalized. http://www.archives.gov/publications/prologue/1998/summer/women-and-naturalization-1.html (citing Act of Feb. 10, 1855 (§ 1994, rev. § 2172); see In re Rionda, 164 F 368 (1908); United States v. Cohen, 179 F 834 (1910)). Congress did eventually allow widowed and divorced women who had lost their U.S. citizenship by marrying an alien husband to regain their U.S. citizenship through actual naturalization. In 1936, Congress allowed widowed and divorce women who had lost their U.S. citizenship by marriage between 1907 and 1922 to regain their U.S. citizenship by applying (using Form N-415, Application to Take Oath of Allegiance to the United States) and taking the oath of allegiance. Then in 1940, Congress allowed even women who continued to be happily married to alien husbands and who had lost their U.S. citizenship by marriage between 1907 and 1922 to resume their U.S. citizenship by applying and taking the oath of allegiance. Id. With such policy concerning dual allegiance and citizenship having been passed down through generations, early Congress surely would not have allowed children born in the United States to aliens to become citizens. With such strong policy of allegiance to the United States, it is nonsensical to believe that early Congress would have allowed a child to be a U.S. citizen by mere birth in the United States while treating his parents to be aliens. Derivative citizenship for married women only ended when Congress passed on September 22, 1922 the Cable Act (42 Stat. 1021). This means that when one spoke about “parents” or “father” in relation to our citizenship laws before 1922, one was really referring to father and mother. With the elimination of derivative citizenship, the Cable Act just made it more difficult for a husband and wife to achieve unity of allegiance and citizenship if that is their desire, for after the act each non-citizen spouse has to naturalize under the naturalization laws. With that backdrop, let us now examine the Minor decision. Those who argue that putative President Barack Obama is an Article II “natural born Citizen” insist that when Minor v. Happersett said that “there have been doubts” as to whether a child born in the United States to alien parents was a “citizen,” the Court really said that “there have been doubts” whether that child was a “natural born citizen.” In other words, these persons argue that Minor included those other potential “citizens” into the “natural-born Citizen” class. But these persons not only ignore the clear text of what the Court wrote, but are also putting intentions into the mind and words into the mouth of our U.S. Supreme Court which simply are not there. Second, we know that Minor could not have doubted whether a child born in the United States to alien parents was a “natural born Citizen,” for the Court knew very well that such a child could not be a "natural born Citizen." The Court in the very same paragraph told us that a "natural born Citizen" was a child born in the country to citizen parents. A child that was born to alien parents was born subject to a foreign power (in the case of Great Britain, an English “natural born subject”). Clearly, under the Court's definition which it had just confirmed in the same paragraph, without “citizen” parents, that child was not and could not be a "natural born Citizen." Minor told us that for one to be a “natural-born citizen,” one could not be a first generation “citizen” vis-à-vis any one parent. Rather, one had to be at least a second generation “citizen” by birth to two “citizen” parents (keeping in mind unity of citizenship of the husband and wife) to be a “natural-born citizen.” As far as the doubts regarding whether that child born to alien parents was even a “citizen,” as we have seen, Minor was correct that such doubts existed. To not conflate and confound the meaning of a “natural born Citizen” with that of a “citizen,” it is critical to understand that never has the debate, including that in Wong Kim Ark, been about whether a child born in the United States to alien parents is an Article II “natural born Citizen” until Mr. Obama entered the political/legal stage. Prior to that, it has always been whether that child was a “citizen.” And in this current debate, we have not only seen Obama’s supporters but also some courts (e.g. Ankeny v. Governor of the State of Indiana, 916 N.E.2d 678 (Ind. Ct.App. 2009), transfer denied, 929 N.E.2d 789 (2010), and Tisdale) that have reached the merits of the issue of what is a “natural born Citizen,” conflate and confound all that is “citizen” into “natural born Citizen.” We have even seen them go as far as to take Wong Kim Ark’s clear holding which speaks only of a “citizen of the United States” and substitute in the place of those clearly written words “natural born Citizen.” In other words, what they have done is, without due process and the rule of law, transform a “citizen” into a “natural born Citizen.” By doing so, they have violated the Founders’ and Framers’ intent that a “natural born Citizen,” who was to assume the great and singular civil and military powers of the Office of President and Commander in Chief, be born free of any foreign influence and allegiance. These Obama supporters do not have one decision from the U.S. Supreme Court, including Wong Kim Ark, or even one Congressional Act which says that any child born in the United States to one or two alien parents is a "natural born Citizen." On the other hand, I have cited and discussed in my Kerchner Pennsylvania Obama ballot challenge brief and at this blog the several U.S. Supreme Court cases that define a "natural born Citizen" as a child born in the country to citizen parents, along with Congressional Acts and other historical sources that support that conclusion. The Constitution at Article V prescribes the means by which the people can amend its provisions. But what we see happening today is Obama, with the aid of the Ankeny [Endnote 5] and Tisdale [Endnote 6] courts, a reticent Congress, power-hungry political parties, and a complicit media, amending Article II’s “natural born Citizen” clause without an Article V constitutional amendment. The question is will our constitutional republic allow him to get away with it? 1. In his 1793 charge to a grand jury, John Jay, our first Chief Justice of the Supreme Court, stated that the “laws of the United States” fell under “three heads or descriptions”: “1st. All treaties made under the authority of the United States. 2d. The laws of nations. 3d The constitution and statutes of the United States.” Patrick J. Charles, Decoding the Fourteenth Amendment’s Citizenship Clause: Unlawful Immigration, Allegiance, Personal Subjection, and the Law, 51 Washburn L.J., Issue 2 (forthcoming Spring 2012) (citing The City Gazette and Daily Advertiser (Charleston, S.C.), August 14, 1793, at 2, col. 1). 2. St. George Tucker was born in Bermuda on July 10, 1752, and died on November 10, 1827 in Virginia. He studied law at the College of William and Mary in 1771 under George Wythe, who also taught law to Thomas Jefferson and John Marshall, and served as chief justice of Virginia. He was fluent in French. He also fought in the Revolutionary War. He became a lawyer in 1775, a law professor at the College of William and Mary, and a judge of Virginia's highest court. As we shall see below, being a law professor at the College of William and Mary is also an important factor in understanding what Tucker’s view would have been on the meaning of a “natural born Citizen.” St. George Tucker wrote in 1803: “The spirit of monarchy is war, and the enlargement of dominion; peace and moderation is the spirit of a republic.” http://www.history.org/foundation/journal/summer08/republican.cfm. Upon President James Madison’s nomination, in 1813 he became a federal district judge for Virginia. He denounced slavery as a contradiction to the American ideal of freedom and an immorality. In 1796, he wrote and published the pamphlet "A Dissertation on Slavery: With A Proposal for the Gradual Abolition of It in the State of Virginia.” Tucker “was arguably the most important American legal scholar of the first half of the nineteenth century.” Paul Carrington, The Revolutionary Idea of University Legal Education, 31 Wm. & Mary L.Rev. 527, 540 (1990). Davison M. Douglas, Foreword: The Legacy of St. George Tucker, 47 Wm. & Mary L.Rev. 1111 (2006) (same), http://papers.ssrn.com/sol3/papers.cfm?abstract_id=1758861. "Tucker established a virtual dynasty of legal and constitutional talent that carried on Jeffersonian principles through successive generations." Clyde N. Wilson, ed., Views of the Constitution of the United States x (Indianapolis: Liberty Fund 1999) (foreword) p. viii (1803). An article which shows what influence St. George Tucker had regarding interpreting and understanding the Constitution is one written by Kurt T. Lash, "Tucker's Rule": St. George Tucker and the Limited Construction of Federal Power, 47 Wm. & Mary L. Rev. 1343 (2006), http://scholarship.law.wm.edu/wmlr/vol47/iss4/8 ; http://scholarship.law.wm.edu/cgi/viewcontent.cgi?article=1242&context=wmlr (explores Tucker’s view of federalism, called Tucker’s Rule, which was that the state’s maintained their sovereignty and reserved powers despite having become part of the union under the Constitution). Further information on St. George Tucker may be read at: http://www.history.org/almanack/people/bios/biotuck.cfm; http://en.wikipedia.org/wiki/St._George_Tucker. David Ramsay, a highly respected doctor and historian from the Founding period, wrote an essay on citizenship during the Founding entitled, A Dissertation on the Manners of Acquiring the Character and Privileges of a Citizen (1789). David Ramsay (April 2, 1749 to May 8, 1815) was an American physician and historian from South Carolina and a delegate from that state to the Continental Congress in 1782-1783 and 1785-1786. He was one of the American Revolution’s first major historians. Ramsay “was a major intellectual figure in the early republic, known and respected in America and abroad for his medical and historical writings, especially for The History of the American Revolution (1789)…” Arthur H. Shaffer, Between Two Worlds: David Ramsay and the Politics of Slavery, J.S.Hist., Vol. L, No. 2 (May 1984). In his 1789 article, Ramsay first explained that there is an “immense” difference between a British “subject” and a United States “citizen,” with the former being “under the power of another” and the latter being “a unit of mass of free people, who, collectively, posses sovereignty.” He informed that “Republics, both ancient and modern, have been jealous of the rights of citizenship.” He then explained that the “original citizens” of the United States were those who were parties to the Declaration of Independence and thereby adhered to the revolutionary cause. But the importance of his work does not stop there, for he also described the future citizens to come after the original citizens, whom he defined as the children born to citizen parents. He said concerning the children born after the declaration of independence, “[c]itizenship is the inheritance of the children of those who have taken part in the late revolution; but this is confined exclusively to the children of those who were themselves citizens….” Id. at 6. He added that “citizenship by inheritance belongs to none but the children of those Americans, who, having survived the declaration of independence, acquired that adventitious character in their own right, and transmitted it to their offspring….” Id. at 7. He continued that citizenship “as a natural right, belongs to none but those who have been born of citizens since the 4th of July, 1776….” Id. at 6. Here, Ramsay referred to “natural right,” which ties into the Framers’ use of the clause “natural born Citizen.” By focusing on citizenship that occurs by “natural right,” Ramsay distinguished citizenship that occurs naturally versus citizenship that occurs by operation of law. It is evident from his writing that in defining the original citizens and the future citizens who were to follow them, Ramsay did not look to English common law but rather to natural law. As we can see, Ramsay required the future citizens to be children of citizens. As we can see, Ramsay put forth a definition of a “natural born Citizen” that only depended upon the child being born to U.S. citizen parents with no mention of place of birth. While he did not call these future citizens “natural-born citizens,” Ramsay’s standard was the same standard Pufendorf provided when he defined the “Indigenes, or Natives,” who he defined as the “Descendants” of the “Original” “Citizens.” Ramsay would have been in a position to know how the Founders and Framers defined a “natural born Citizen.” For further information on David Ramsay, see my essay entitled, Founder and Historian David Ramsay Defines a Natural Born Citizen in 1789 , accessed at http://puzo1.blogspot.com/2010/04/founder-and-historian-david-ramsay.html. 4. We argued in the Commonwealth Court of Pennsylvania that not only did Obama fail to conclusively prove that he is a “natural born Citizen” and therefore eligible under Article II, Section 1, Clause 5 to be elected President, but that he has also failed to provide any competent and sufficient evidence to the Commonwealth of Pennsylvania as to his true identity, a matter which showed that his nominating petition was defective and that he therefore failed to show under 25 P.S. Sec. 2937 that he is a “person entitled to file the same” [the nominating petition]. The Commonwealth Court of Pennsylvania, not reaching the merits of the definition of an Article II “natural born Citizen” or whether Obama meets that definition, and also not addressing the issue regarding Obama failing to yet prove his identity which presented a petition defect apart from any issue of Article II eligibility, on March 1, 2012 dismissed the Kerchner/Laudenslager petition to set aside the Obama nomination petition for lack of jurisdiction. The Court based its decision strictly on whether it had jurisdiction over the question of Article II eligibility. It did not address Kerchner’s and Laudenslager’s argument regarding Obama having failed to prove his identity, which is a petition defect and which disqualifies Obama from showing that he is a “person entitled to file the same” [his petition]. 25 P.S. Sec. 2937. The Court ruled that if Obama had filed an affidavit saying he is constitutionally eligible to be President, the Court would have had jurisdiction over an objection to his eligibility. But since he did not file in Pennsylvania any such affidavit, then the Court did not have jurisdiction over the objectors’ petition. Apart from the Court failing to address the objectors’ Obama identity argument, such a rule seems to imply that what Article II, Section 1, Clause 5 says and whether Obama satisfies what it says changes based on whether Obama filed an affidavit in which he tells the world what he personally thinks about his eligibility. In other words, we have allowed a candidate’s subjective belief (whether held in good or bad faith) regarding his eligibility for the Office of President to trump the objective constitutional meaning of Article II, Section 1, Clause 5 (the “natural born Citizen clause) and established facts. Also, the same Pennsylvania Court denied twice without both times stating any reason Karen Kiefer’s motion to have me admitted pro hac vice. It should be noted that Attorney Van Irion was also denied pro hac vice admission in Georgia. 5. 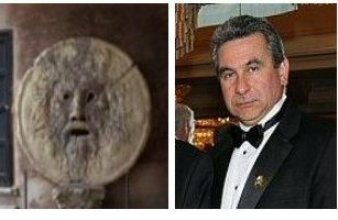 For my comments on the Ankeny decision, see All That Is Wrong with Georgia State Judge Michael M. Malihi’s Decision that Putative President Obama Is a “Natural Born Citizen” , accessed at http://puzo1.blogspot.com/2012/02/all-that-is-wrong-with-georgia-state.html. 6. For my comments on the Tisdale decisions, see Tisdale v. Obama and the “Natural Born Citizen” Clause , accessed at http://puzo1.blogspot.com/2012/02/tisdale-v-obama-and-natural-born.html. The New York Times on April 21, 2010, did a story entitled, Obama and the ‘Birthers’ in the Latest Poll, by Dalia Sussman and Marina Stefan. The article reported that "[i]n a recent New York Times/CBS News poll, 58 percent said Mr. Obama was born in the United States. That leaves a significant minority who said they thought he was born in another country (20 percent) or said they did not know (23 percent)." Question No. 50 in the poll was: "According to the Constitution, American Presidents must be 'natural born citizens.' Some people say Barack Obama was NOT born in the United States, but was born in another country. Do YOU think Barack Obama was born in the United States, or was he born in another country?" The result was: Born in US 58%, Another country 20%, Don't Know 23%. Hence, these numbers show that 43 percent do not believe that Obama was born in the United States. What a serious national security situation we are living in when the de facto President and Commander of our vast military power has not convincingly proven with certainty to almost half the people of this nation that he was truly born in the United States. The New York Times article, as usual from this pro-Obama paper, is written in such a way as to give the reader the impression that Obama has convincingly proven that he was born in Hawaii and that those who do not believe that Obama was born there are misinformed and poorly educated. What the authors of the article fail to realize or refuse to report is that concerned Americans have very good reasons to doubt that Obama was born in Hawaii. May 2010 Updates on Polls: Additional subsequent polls results. A newer poll reported on May 31, 2010 reports 55% of Americans want Obama to release all his hidden and sealed early life records. Another poll released in early August by CNN and as reported by WND.com shows 6 of 10 have complete doubt or some doubts and don't totally believe Obama's U.S. birth story. Details from CNN story: 11% definitely not born in USA, 16% probably not born in USA, 29% probably but not sure born in the USA, 42% definitely was born in USA. This does not add up to be 100%. Reason for the missing 2% is not provided by CNN. Possibly it was due to truncating off decimals in the category percentages or rounding errors. WND combined the 11%, 16%, and 29% which totals to 57% and then rounds up to get the 6 out of 10 statistic. CNN talking heads combine the 42% with the 29% and report that as 71% believe Obama's born in the USA birth story ... but fail to clearly point out that 29% of that 71% do not 100% believe Obama's born in the USA story but only probably believe it. Stack up the stats anyway you want there is a very significant percentage of the American public which doubts the Obama nativity story. But still the main stream media refuses to demand that Obama release certified true and correct copies of the original records he is refusing to release such as his original long form Hawaiian birth registration records and any amendments to same and his application, financial aide applications for when he attended Occidental College in CA after graduating from high school, his travel and passport records, and possible legal adoption records when his mother remarried and when Obama moved to and lived with his step-father in Indonesia for 4-5 years. Those and many other of his requested documents Obama refuses to release. And yet the main stream media refuses to ask Obama for those documents to be released and sides with Obama against those who ask for them to be released. Update 20 Mar 2011: Shocking new poll shows that now less than 10% of the American people believe that Obama has conclusively proven he was born in the United States and is therefore qualified to be President. Some key points before we proceed to the evidence of Obama's place of birth. Article II, Section 1, Clause 5 provides: “No person except a natural born citizen, or a citizen of the United States, at the time of the adoption of this Constitution, shall be eligible to the office of President; neither shall any person be eligible to that office who shall not have attained to the age of thirty five years, and been fourteen Years a resident within the United States.” The current debate is whether Putative President Obama is a “natural born Citizen” under this Presidential eligibility article in our Constitution. While many do not understand this, being born in the USA is only one part of the issue. Being born in the USA is a necessary part, but not sufficient part, of being a "natural born Citizen." I will explain. There has been much confusion regarding the role that Obama's place of birth (represented by his birth certificate) or parentage (represented by his alien father) plays in his being a "natural born Citizen." A “natural born Citizen” must be born in the United States or what is deemed its equivalent. This is called the jus soli requirement. We know that while Obama maintains that he was born in Hawaii, there exists a considerable amount of evidence that he was born in Kenya. Some argue that Obama has to date not yet conclusively shown that he was born in Hawaii and that on the contrary, he was born in Kenya. They argue that since Obama was born in Kenya, he is not and cannot be a “natural born Citizen.” Hence, some focus on Obama's place of birth as the only factor that needs to be considered in the question of whether he is a "natural born Citizen." The Fourteenth Amendment citizenship clause also causes further confusion in the Obama eligibility question, for some incorrectly ascribe a controlling effect to it. The Fourteenth Amendment requires that one be born in the United States and be “subject to the jurisdiction thereof” in order to be a born “citizen of the United States” thereunder. The way that the Amendment’s “subject to the jurisdiction thereof” clause is currently interpreted, it does not contain any U.S. citizen parent requirement. But a simple reading of the Amendment’s text shows that it only deals with a “citizen of the United States” and not a “natural born Citizen.” Hence, showing that Obama is a Fourteenth Amendment born “citizen of the United States” (the Fourteenth Amendment born “citizen of the United States” standard) without more is not sufficient to demonstrate that he is an Article II “natural born Citizen” (the Article II “natural born Citizen” standard). Nevertheless, Obama must at least prove that he is a born “citizen of the United States” (born in the United States) before he can prove that he is an Article II “natural born Citizen." What this means is that proving that Obama was born in the United States is a necessary condition for proving that he is a "natural born Citizen," but is not a sufficient condition. Hence, that Obama may have been born in the United States does not necessarily make him a "natural born Citizen." Rather, with his being born in the United States being a necessary condition, his not being born here would disqualify him from being both a Fourteenth Amendment born “citizen of the United States” and also an Article II "natural born Citizen." In such a case, he would be disqualified from being President. But since we might in the end learn that Obama was born in Hawaii, it is not wise to rely solely on the place of birth factor when questioning whether Obama is a “natural born Citizen” and to completely disregard the parentage factor contained in the original definition of a "natural born Citizen." Likewise, since the United States Supreme Court has yet to rule on the definition of an Article II "natural born Citizen" within the context of a case raising the question of whether a person is eligible to be President and Commander in Chief of the Military, it is not wise to rely only on the parentage factor when questioning whether Obama is a “natural born Citizen” and to totally discount the place of birth factor. Please note that the Kerchner et al. v. Obama/Congress et al. case which was filed on January 20, 2009, after Congress confirmed Obama but before Chief Justice Roberts swore him in, and which the courts dismissed for lack of standing argued both the place of birth and U.S. citizen parents factors. One might wonder why so many Americans are not convinced that Obama was born in Hawaii as he claims. Was Obama born in Hawaii? What is the evidence for and against his being born in Hawaii? Let us review the evidence pro and con on his place of birth being Hawaii or Kenya. (13) There exists a birth announcement in two local Honolulu newspapers printed in August 1961 (but these announcements alone do not prove that Obama was born in Honolulu). (2) The Kenyan newspaper, Daily Nation, reported that at an event in May 2010, honoring Obama's step-grandmother, who is known there as "Momma Sarah," she commented that, "Even the US President passed through my hands." (11) Obama has refused to give consent to Kapi’olani Medical Center for it to release minimal documents confirming he was born there as he claims. Without his consent, the hospital refuses to either admit or deny whether Obama was born there. When asked whether they would allow someone to falsely claim he or she was born there, the hospital refused to answer the question. See, TheObamaFile.com, at http://www.theobamafile.com/_eligibility/Hospitals.htm which provides information on the steps WND took to confirm whether Obama was born in that hospital. (17) Obama has only produced for public viewing a 2008 computer image of an alleged computer generated June 6, 2007 Certification of Live Birth (COLB) which contains no independently verifiable information to corroborate his alleged birth in Honolulu as would be found on a Certificate of Live Birth (Birth Certificate). The COLB only confirms that a child was indeed “born live,” but it contains no reference as to where in Honolulu that birth took place (e.g. in what hospital) or who was present at the time of birth to confirm that the birth did in fact occur in that particular place (e.g. the delivering doctor or a midwife). Why would Obama have asked the State of Hawaii for the COLB in 2007? What was his need back then for the document? FactCheck.org web site has this to say about the COLB: "The document is a "certification of birth," also known as a short-form birth certificate. The long form is drawn up by the hospital and includes additional information such as birth weight and parents' hometowns. The short form is printed by the state and draws from a database with fewer details. The Hawaii Department of Health's birth record request form does not give the option to request a photocopy of your long-form birth certificate, but their short form has enough information to be acceptable to the State Department. We tried to ask the Hawaii DOH why they only offer the short form, among other questions, but they have not given a response." FactCheck did provide an "Update," on August 26, when they stated: "We received responses to some of our questions from the Hawaii Department of Health." They go on to explain they did get some clarification from them to "some" of their questions. But they do not address why DOH did not answer their question as to why DOH "only offer the short form" COLB. http://www.factcheck.org/elections-2008/born_in_the_usa.html. It is unbelievable that a fact-checking organization such a FactCheck (actually a reading of their "objective" information on this issue shows that they are quite biased and prejudiced on the issue in favor of Obama) would allow such an important matter to just die with the excuse that the DOH did not provide a response to their request for information. Would any reasonable person call that responsible and thorough fact investigation? Hawaii Department of Heath has "affirmed that no paper birth certificate records were destroyed when the department moved to electronic record-keeping in 2001." http://www.wnd.com/index.php?pageId=105347. For an explanation as to who at the FactCheck organization allegedly handled and photographed the COLB and "authenticated" the document (Jess Henig and Joe Miller) go to http://www.theobamafile.com/_eligibility/AnnenbergFactCheckers.htm. What makes matter even more confusing and hence worse is the fact that Hawaii starting in October 2008 changed the name of its Certification of Live Birth. Now they call it a Certificate of Live Birth. See what a Certificate of Live Birth vs. a Certification of Live Birth looked like in Hawaii prior to Oct 2008. They decided to do this only after the question of Obama's alleged "birth certificate" image was placed online in June 2008 by the Daily Kos and the Obama campaign had been boiling among the American public. There simply is no other reason not tied to Obama which would support Hawaii's decision to make such a change. It is beyond being reasonable that Hawaii for no apparent reason other than helping Obama would call two different types of documents that contain different information and have a different probative value the same name. Anyone who is only relying on the fact that Hawaii officials do not say that Obama was born in any place other than Hawaii is missing the point which is what sufficient and credible proof exists that Obama was born in Hawaii. Fukino's statements and even an authenticated COLB are legally insufficient for proving that Obama was born in Hawaii, for they merely represent that Obama's alleged birth record is on file in the state of Hawaii. They fall short of providing the information necessary to determine whether Obama was in fact born in Hawaii. Neither Fukino's statements nor the COLB offer any information regarding who supplied the information that is the basis of any alleged birth certificate nor do they confirm the authenticity of the information provided by that unknown person. Again, Fukino's statements and the COLB merely indicate that birth information is “on file," but we do not know who provided the information or whether that information is authentic. In short, we do not know what evidence Hawaii is relying on to simply say that he was born in Hawaii. If the underlying root "evidence" is fraudulent, then anything Hawaii says is of no value and surely not evidence that Obama was in fact born in Hawaii. In other words, in such a case, Hawaii would be picking fruit from a poisonous tree. Additionally, Fukino, as the Director of a state's health department, has no legal authority or competence to be declaring Obama an Article II "natural born Citizen." Given that Congress refused to address this question despite its constitutional duty to qualify the President under the Twentieth Amendment, this is now a constitutional question which only a court of competent jurisdiction and eventually the United States Supreme Court can answer. Obama alleges he was born in Kapi'olani Medical Center. At no time during the ongoing public debate about whether Obama was born in Hawaii has any official from Hawaii at least informed the public that Obama's alleged vital records show that his birth certificate from 1961 was "completed and filed" with the health department in Honolulu by some official of that hospital or a physician or midwife associated with that institution. If Obama was born in a hospital as he claims, we cannot reasonably believe that his birth certificate would have been completed and filed by one of his parents. Additionally, under this statute, Hawaii has the power and authority to obtain medical records from Kapi'olani Medical Center to confirm Obama's alleged Hawaiian birth. At no time did Hawaii inform the American public that it in fact confirmed with that hospital that Obama was in fact born there which it can do under the cited statute. Hawaii has withheld this underlying evidence from the public. This withholding of evidence is a grave matter given that there exists such reasonable doubt as to whether Obama, the putative President and Commander in Chief of our military might, was in fact born in Hawaii. Under Section 338-5, any birth certificate has to be completed and filed by some institution (hospital) or person (doctor, midwife, or parent). This statute also shows that Hawaii has the authority to confirm any reported birth by examining medical records. While Hawaii pretends to have come clean with the American public, it did not even provide such basic information or conduct such due diligence which would at least give the public greater assurance that Obama's birth record is genuine. Moreover, no Hawaii official has yet to confirm that the online image and picture of Obama's COLB is a true and accurate image of the paper COLB that they allegedly issued to Obama in 2007. They also have yet to confirm that they ever even issued the COLB to Obama. When citizen journalists (Miss Tickly and the Post & Email, etc.) asked Hawaii officials for their opinion of the COLB image and pictures, they did not answer their inquiries. In response to a question from WorldNetDaily, the Hawaii Department of Health refused to authenticate either of the two versions of President Obama's short-form Certificate of Live Birth, or COLB, posted online, the image produced by the Obama campaign and the images released by FactCheck.org. Janice Okubu, the public information officer for the Hawaii Department of Health, also had no explanation for why Dr. Fukino's initial press release last October and subsequent press release also avoided declaring the posted images to be of authentic documents. (23) The proffered online image of the Certification of Live Birth (COLB) put on the internet states in the lower left corner a date of "Filing" the birth registration. It does not state that the birth registration was "Accepted." Computer generated COLBs obtained for other people registered in Hawaii have the word and date "Accepted" in that field. See these examples compared to Obama's COLB. This implies the birth registration was never finally accepted and that additional information on the birth registration was requested by the state but never received. If the state questioned the evidence in 1961 provided by the family to register the birth as occurring in Hawaii, which is all the more reason now to investigate the birth registration method and statements provided to the Health Department by the family back in 1961. What evidence was missing such that the registration was never "Accepted;"
(28) Susan and Gretchen Nordyke ("the Nordyke twins") were born at Kapi'olani Maternity and Gynecological Hospital Aug. 5, 1961, one day after Obama was allegedly born at the same facility on August 4, 1961. These twins produced for the public copies of their long-form birth certificates, otherwise known as a Certificate of Live Birth, issued by the Hawaii Department of Health. The Nordykes' certificates include information missing from the short-form document that Obama published online (a Certification of Live Birth or know as a COLB), including the name of the hospital where the babies were born and the name of the attending physician that delivered them. Apart from the fact that it is clear that a long-form Certification of Live Birth actually exists for the same time when Obama was born, the twins' birth certificates also raise an issue regarding sequential numbering of Hawaii birth certificates. One would reasonably assume that the Nordyke twins' certificate number on their birth certificate should be higher since their birth would have occurred after Obama's and their birth also increased the population. Susan Nordyke was born at 2:12 p.m. Hawaii time and was given No. 151 – 61 – 10637, which was filed with the Hawaii registrar Aug. 11, 1961. Gretchen Nordyke followed at 2:17 p.m. and was given No. 151 – 61 – 10638, which was also filed with the Hawaii registrar Aug. 11, 1961. The Obama Certification of Live Birth (COLB) shows his certification number to be 151 1961-010641, which is three numbers later from the last born twin rather than being a number earlier than the first born twin. Raising more questions is the fact that Obama's birth was registered with the Hawaii registrar three days earlier, Aug. 8, 1961. How could his birth be registered earlier than the twins but be given a certificate number later than the twins? Another question is why the middle figure in Obama's purported registration is 1961, indicating the year of birth, while the Nordykes' is merely 61? WND was unable to receive a response from Hawaii officials regarding the state's procedure for issuing registration numbers and their providing a reasonable answer to these questions. The Nordyke twins’ birth certificate story was fully reported at http://www.wnd.com/index.php?pageId=105347. • Stephanopoulos of ABC news said during the 2008 campaign that he too was a classmate of Obama at Columbia class of 1984. He said he never had one class with him. • The Wall Street Journal on Sept 11, 2008, reported that Obama was never at Columbia University. • Looking for evidence of Obama's past, Fox News contacted 400 Columbia University students from the period when Obama claims to have been there. But no one remembered him. • Wayne Allyn Root was, like Obama, a political science major at Columbia who also graduated as Valedictorian from his high school, Thornton-Donovan School, then graduated from Columbia University in 1983 as a Political Science major in the same class as Barack Hussein Obama was supposed to have been in. In 2008, Root says of Obama, "I don't know a single person at Columbia that knew him, and they all know me. I don't have a classmate who ever knew Barack Obama at Columbia. Ever! Nobody recalls him. I'm not exaggerating, I'm not kidding." Root adds that he was also, like Obama, "Class of '83 political science, pre-law" and says, "You don't get more exact or closer than that. Never met him in my life, don't know anyone who ever met him. At the class reunion, our 20th reunion five years ago, who was asked to be the speaker of the class? Me. No one ever heard of Barack! And five years ago, nobody even knew who he was. The guy who writes the class notes, who's kind of the, as we say in New York, the macha who knows everybody, has yet to find a person, a human who ever met him.” A bio on Root may be found at http://en.wikipedia.org/wiki/Wayne_Allyn_Root#column-one. • Two investigators researched the Columbia University yearbooks (1981-1985), and found the following: there are no pictures or mention of the names Obama, Soetoro, or Dunham in the yearbooks; Obama’s alleged Political Science class of 1983 had 43 students only 2 of whom were black and those two looked nothing like Barack Obama (pictures in detail and in color). CIA Columbia Obama Trial - Guilty Verdict Press Conference http://www.ustream.tv/recorded/7098248. For more on the Guilty Verdict Press Conference see: http://atlah.org/. • Rev. Manning, who was in studies at the Union Theological Seminary, an across-the-street sister-institution to Columbia, and a member of the Columbia University Student Union in 1981, 82, and 83, “never heard of or saw a fellow black student named Obama or Soetoro or Dunham.” He also did extensive investigation within the Harlem community where he has his church and where he has spent so many years of his life and could find no evidence of Obama ever attending Columbia University. • Obama consistently declines requests to talk about his years at Columbia, provide school records, or provide the name of any former classmates or friends while at Columbia. • No one at Columbia remembers Obama at Columbia. Why does not anyone in Obama's college class remember him? Maybe he never attended class? Maybe he never attended Columbia? He won't allow Colombia to release his records either. All this is very suspicious. (33) A college instructor who worked as a Senior Elections Clerk for the City and County of Honolulu in 2008 has stated in May 2010 that Obama was not born in Hawaii, and that a long-form, hospital-generated birth certificate does not exist in that State. Tim Adams now teaches English at Western Kentucky University, in Bowling Green, Ky. "There is no birth certificate," said Tim Adams. "It's like an open secret. There isn't one. Everyone in the government there knows this." Adams, who says he is a Hillary Clinton supporter who then voted for John McCain when Clinton lost the Democratic nomination to Obama, told WND, "I managed the absentee-ballot office. It was my job to verify the voters' identity." He says during the 2008 campaign, the issue of Obama's constitutional eligibility was raised. His elections office was inundated with requests to verify his birthplace. He adds: "I had direct access to the Social Security database, the national crime computer, state driver's license information, international passport information, basically just about anything you can imagine to get someone's identity," Adams explained. "I could look up what bank your home mortgage was in. I was informed by my boss that we did not have a birth record [for Obama]." At the time, there were conflicting reports that Obama had been born at the Queen's Medical Center in Honolulu or the Kapi'olani Medical Center for Women and Children across town. So Adams says his office investigated at and contacted both facilities. He adds: "They told us, 'We don't have a birth certificate for him.'" "They told my supervisor, either by phone or by e-mail, neither one has a document that a doctor signed off on saying they were present at this man's birth." To date, no hospital has been willing to confirm that Obama was born there. "His title was senior elections clerk in 2008," said Glen Takahashi, elections administrator for the City and County of Honolulu. Takahashi also confirmed Adams' time frame at the office from spring until the month of August. "We hire temporary workers, because we're seasonal," he said. However, when WND asked Takahashi if the elections office could check on birth records, he said, "We don't have access to that kind of records. [There's] no access to birth records." Adams responded, "They may say, 'We don't have access to that.' The regular workers don't, the ones processing ballots; but the people in administration do. I was the one overseeing the work of the people doing the balloting." Adams stressed, "In my professional opinion, [Obama] definitely was not born in Hawaii. I can say without a shadow of a doubt that he was not born in Hawaii because there is no legal record of him being born there. If someone called and asked about it, I could not tell them that person was born in the state." A June 5, 2010 radio interview of Mr. Adams conducted by James Edwards, host of a weekly radio show on WLRM Radio in Memphis, Tennessee, can be heard at http://www.youtube.com/watch?v=9AV4YxiD7Jo&feature=player_embedded. This new revelation is also reported at http://obamareleaseyourrecords.blogspot.com/2010/06/hawaii-confirms-tim-adams-was-senior.html and http://www.wnd.com/index.php?fa=PAGE.view&pageId=165041. A very good YouTube summary of this new news can be heard at: http://www.youtube.com/watch?v=Wo3Aj2eqmS8. WND.com reporters did personally speak to Mr. Adams and he confirmed the truth of what he is reported to have said on the radio program. Mr. Adams has reaffirmed his claims to a network television affiliate. Mr. Adams was interviewed by Gene Birk of ABC affiliate WBKO-TV in Bowling Green, Ky. Video of the 9-minute interview has been posted on YouTube and is viewable at this link. He confirmed his previous statement when he said: "As of the time I was in Hawaii working in the elections office," said Adams, "we had many people who were asking about the eligibility of Senator Obama to be president. I was told at the time there is no long-form birth record, which would have been the case if President Obama was born in [a] hospital in Honolulu. There is no such form in Hawaii." • Hawaii state Sen. Will Espero, a Democrat, has suggested that legislation could be adopted to allow for the release of Obama's birth records so that those who question where he was born may be satisfied. While Espero said he believes Obama was born in Hawaii, he added, "My decision to file the legislation was primarily a result of the fuss over President Obama's birth records and the lingering questions." • Oklahoma state Rep. Mike Ritze, sponsored a proposal demanding that candidates for political office including those running for President produce eligibility documentation. Ritze says he regularly gets questions from his constituents about Obama's eligibility. He adds that an "ounce of prevention is worth a pound of cure" on the issues of candidate qualifications and eligibility. • In March 2009, Rep. Bill Posey, R-Fla., introduced H.R. 1503, the Presidential Eligibility Act. It is still pending in a House committee and has nearly a dozen co-sponsors, including Reps. Dan Burton, R-Ind. ; Ted Poe, R-Texas; Marsha Blackburn, R-Tenn.; John Campbell, R-Calif.; John R. Carter, R-Texas; John Culberson, R-Texas; Bob Goodlatte, R-Va.; Randy Neugebauer, R-Texas; Trent Franks, R-Ariz.; Louie Gohmert, R-Texas; and Kenny Marchant, R-Texas. The proposed law seeks to "amend the Federal Election Campaign Act of 1971 to require the principal campaign committee of a candidate for election to the office of President to include with the committee's statement of organization a copy of the candidate's birth certificate … to establish that the candidate meets the qualifications for eligibility to the Office of President under the Constitution." • Arizona state Sen. Sylvia Allen, R-Snowflake, said the controversy over Obama and his birth certificate has raised questions. "It just makes sense and will stop any controversy in the future to just show you are a natural born citizen," she told the Arizona Capitol Times. • Arizona state Rep. Judy Burges, R-Skull Valley, told WND that she has been getting questions from other states about H. 2442, a proposal she sponsored to require future presidential candidates to show they are a "natural born citizen" and therefore eligible under the Constitution to be President. Some three dozen lawmakers have co-sponsored the bill and they want state officials to independently verify the accuracy of documentation. • U.S. Rep. Nathan Deal, R-Ga., sent a December 10, 2009 letter to the White House formally requesting that Obama address questions about his place of birth. Deal, who is running for governor, said several months ago he would ask Obama to prove his eligibility. "I have looked at the documentation that is publicly available, and it leaves many things to be desired," Deal said in November. • Sarah Palin, former vice-presidential candidate, affirmed that questions about Barack Obama's eligibility for office are legitimate. "I think it's a fair question, just like I think past association and past voting records – all of that is fair game," Palin said. "The McCain-Palin campaign didn't do a good enough job in that area." • Former House majority leader Tom DeLay, in October 2009, provided his views on Obama's place of birth issue, saying, "Why wouldn't the president of the United States show the American people his birth certificate? You have to show a birth certificate to play Little League baseball. It's a question that should be answered. It's in the Constitution that you have to be a natural born citizen of the United States to be president." • When U.S. Rep. Roy Blunt, R-Mo., was asked whether he believes Obama is eligible to be president, he said: "What I don't know is why the president cannot produce a birth certificate. I don't know anyone else who can't produce one. I think that's a legitimate question." • U.S. Rep. Trent Franks, R-Ariz., believes Obama was born in the U.S. But he also said he thinks Obama is trying to hide something. "I believe he's a natural born citizen of the United States. Therefore, even if he acts un-American and seems to go against American interests, he's still an American-born citizen," he said. "All that being said, probably Barack Obama could solve this problem and make the birthers back off by simply showing ... his long form birth certificate." "I don't know what it is that he doesn't want people to see the birth certificate. I don't think it has to do with his natural-born citizenship," Franks continued. "He's spent an awful lot of money to keep people from seeing the birth certificate. ... I think it has to do with something else." • Feminist icon, Camille Paglia, a Salon.com columnist who earlier wrote about the ambiguities of President Barack Obama's birth certificate, told a National Public Radio audience that those who have questions about his eligibility actually have a point. "Yes, there were ambiguities about Obama's birth certificate that have never been satisfactorily resolved. And the embargo on Obama's educational records remains troubling," she wrote. • In September 2009, New Hampshire State Rep. Laurence Rappaport, R-Colebrook, said he was tired of telling his constituents that he is not sure of Obama's eligibility to serve as President. He met with New Hampshire's secretary of state, William Gardner, who administers the state's elections, to demand answers. "Regardless of where he was born, is he a natural born citizen as required by the Constitution? I don't know the answer to that," Rappaport said. "My understanding is that … a natural born citizen had to be someone with two American parents. If that's true, his father was a Kenyan and therefore a British subject at the time. Then there's the issue: if he was born out of the country, was his mother old enough at the time to confer citizenship? "I expect somebody to come up with the legal answers to this," Rappaport told WND, "and so far that hasn't happened." (35) As we know, the only "document" that Obama has produced for the American public is an alleged 2008 computer image (which some experts have declared to be a forgery) of an alleged 2007 Certification of Live Birth (COLB) (which Hawaii has yet to even confirm is authentic). Hence, his only proof of where and when he was born is this digital image of only a short-form document and not the long-form birth certificate which latter but not the former includes the name of the hospital and delivery doctor. Apart from the question of whether either or both alleged computer image of an alleged paper document are authentic, there are many problems with simply relying on a birth certificate as conclusive evidence of the place and date of birth. Birth certificate fraud is a real problem in the United States. The U.S. Office of Inspector General published a report in September 2000, entitled Birth Certificate Fraud. The report explains that over the last 25 years there have been a number of studies addressing the problem of birth certificate fraud. The report states that there exist misconceptions among the public as to the integrity of birth certificates. The report says that with current technological advances with computers and the internet, it is easier to produce counterfeit birth certificates. It explains that many times the alleged birth certificates produced by a government agency are based on false or fraudulent information or do not even have documentary evidence to corroborate the veracity of the birth event as stated in the birth certificate. It explains how a birth certificate that is "spawned" by false information or documents is itself fraudulent. The report concludes that "birth certificates alone do not provide conclusive or reliable proof of identity." It adds that "[w]hen used in combination with other documents, birth certificates can add to the level of proof in establishing eligibility and identity." The report recommends that birth certificates should be used "only with other documents." The full report may be read at http://oig.hhs.gov/oei/reports/oei-07-99-00570.pdf. We should remember that Obama has refused to release to the American public any of his "other documents" (birth, medical, travel, work, and education). This refusal on his part is very troubling given that the Inspector General in his report recommends that birth certificates be used "only with other documents" and that with Obama we are talking about making sure that he is who he says he is and therefore eligible to receive the vast and singular civil and military powers of the Office of the President and Commander in Chief of the Military of the United States. See also the recent change to the law in Puerto Rico needed because of the massive birth certificate fraud involving birth certificates from there. http://www.defense.gov/news/newsarticle.aspx?id=59715. ("The Puerto Rican government, in cooperation with the departments of State and Homeland Security, has enacted a new law that invalidates all Puerto Rico birth certificates issued on or before June 30. The law, which takes effect July 1, is intended to combat the fraudulent use of Puerto Rico birth certificates to obtain U.S. passports, Social Security benefits and other federal services, according to the Puerto Rico Federal Affairs Administration"). See also Department of Justice news release on fraudulent birth certificates from the Hudson County Office of Vital Statistics (HCOVS), in New Jersey. http://www.freerepublic.com/focus/f-chat/1349297/posts. ("As part of the investigation, federal agents executed a search warrant of the HCOVS on Feb. 18, 2004, which resulted in the seizure of hundreds of suspect Certificates of Live Birth which falsely indicated that the named individuals were born in Jersey City, when in fact, they were born outside the United States and were in the United States illegally"). (36) Bill Keller, leader of LivePrayer.com, an internet ministry that has over 2.4 million subscribers worldwide and who is seen daily on Comcast's MyTV8, has issued a $10,000 reward to MSNBC host Rachel Maddow to produce Obama's Hawaiian long-form birth certificate. Late last year, Keller was hired to produce and host an infomercial that was seen in markets around the country. He asked the simple question, where was Obama really born? Maddow used her MSNBC program to mock and demean Keller and others who simply request that Obama produce his long-form birth certificate. Keller contacted Maddow's producers and offered to appear with her on her program, but she declined his offer. As a result, Keller has made his $10,000 offer to Maddow to produce Obama's Hawaiian long-form birth certificate. One would think that if Obama has released his birth certificate like his enablers tell the world, the $10,000.00 should be easy money for Maddow to earn. But let us see if she is able to produce the birth certificate and take her cash. (37) Tanzanian newspaper "The Citizen" published in English reports on 29 Jun 2010 that Obama was born outside of the USA but that did not preclude him from being elected President in the USA and that the people of Zanzibar should follow the example of Obama. (38) 2nd Tanzanian newspaper "Daima" published in Swahili with a reporter in Nairobi Kenya reported on 2 Sep 2006 about Senator Obama's visit to Kenya that year that Obama was born there in Kenya. Translation provide by the Google Translator online services. (39) On April 27, 2011, Obama released on the White House server an internet image of an alleged Certificate of Live Birth which states that he was born at Kapi'olani Hospital in Honolulu, Hawaii, on August 4, 1961. It also states that his father was Barack Obama Sr. and his mother was Stanley Ann Dunham. 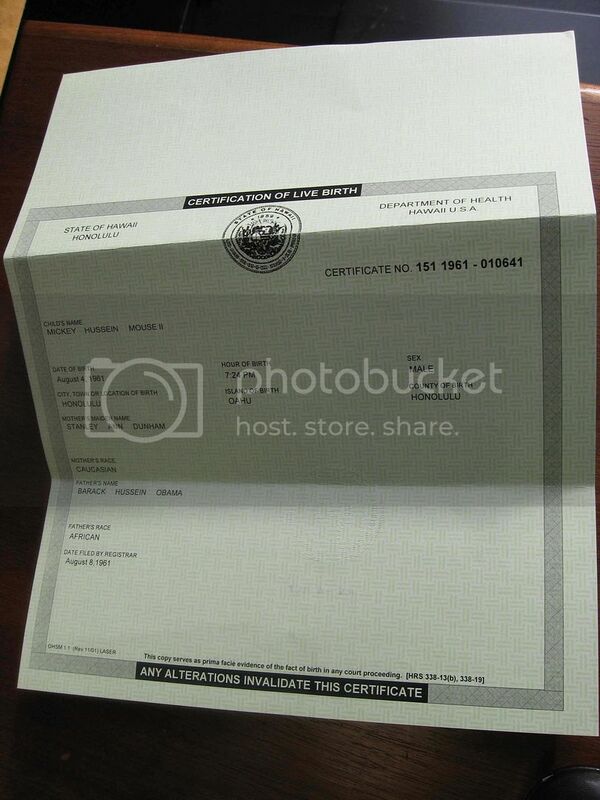 Immediately upon release of this computer image, various computer and internet image experts and knowledgeable persons said that the image was not that of a real paper birth certificate, but rather was an image that was electronically assembled. In other words, the consensus among so many of these experts and knowledgeable persons is that the internet-imaged alleged birth certificate is a forgery. My articles on the forgery are: Obama Releases His Alleged Long Form Certificate of Live Birth But He’s Still Not a Natural Born Citizen , accessed at http://puzo1.blogspot.com/2011/04/obama-releases-his-alleged-long-form.html ; Obama’s On-Line Image of His Alleged 1961 Long-Form Certificate of Live Birth Contains Evidence of Kerning Proving That the Actual Paper Certificate of Live Birth Is a Forgery , accessed at http://puzo1.blogspot.com/2011/05/obamas-on-line-image-of-his-alleged.html ; When Will Congress and the FBI Investigate the Suspicious Circumstances Involved With Obama’s Alleged Long-Form Certificate of Live Birth? , accessed at http://puzo1.blogspot.com/2011/05/when-will-congress-and-fbi-investigate.html. These articles contain many links which will take the reader to the many sources which demonstrate how they concluded that the birth certificate image is a forgery. (40) With the great doubts with the authenticity of the April 2011 Certificate of Live Birth that Obama released on the internet, 250 members of the Surprise, Ariz., Tea Party, presented a signed petition to Arizona Maricopa County Sheriff Joseph Arpaio in August 2011, asking him to undertake an investigation into that alleged document. Sheriff Arpaio agreed to investigate the matter through a cold case posse. Sheriff Arpaio organized the posse. The posse was comprised of former law enforcement officers and lawyers with law enforcement experience. Beginning in October 2011, it interviewed dozens of witnesses and examined hundreds of documents. It also took numerous sworn statements from witnesses around the world. Sheriff Joe Arpaio, based on that 6-month investigation, has concluded that there is probable cause that Obama’s April 2011 internet released Certificate of Live Birth is a forgery. His report was released on March 1, 2012. His posse concludes that there is probable cause to believe someone committed two crimes. First, they say it appears the White House created a forgery of a government document that it characterized as an officially produced governmental birth record. Second, the White House fraudulently presented to the residents of Maricopa County and to the American public at large a forged government document representing that it was “proof positive” of President Obama’s alleged 1961 Hawaii long-form birth certificate and therefore proof that Obama was born in Hawaii. "President Barack Obama's long-form birth certificate released by the White House on April 27, 2011, is suspected to be a computer-generated forgery, not a scan of an original 1961 paper document as represented by the White House when the long-form birth certificate was made public," Arizona's Maricopa County Sheriff Joe Arpaio said at a press conference on March 1, 2012 in Phoenix. He continues: "My investigators believe that the long-form birth certificate was manufactured electronically and that it did not originate in a paper format as claimed by the White House." The Cold Case investigators further determined that the Hawaii Department of Health has engaged in systematically obstructing the public from inspection whatever original 1961 birth records the Hawaii Department of Health may have in their possession. The investigators documented a number of inconsistent and misleading representations that various Hawaii government officials have made over the past five years regarding what, if any, original birth records are held by the Hawaii Department of Health. The Cold Case investigators have not yet determined who, when, or precisely how the long-form computer-generated birth certificate released on April 27 may have been forged. But the investigators say that based on the evidence contained in the computer-generated PDF file released by the White House as well as important deficiencies in the Hawaii process of certifying the long-form birth certificate they have established probable cause that a forgery has been committed. Arpaio also emphasized that the Hawaii Department of Health needs to provide, as part of the full disclosure, evidence regarding the chain of custody of all Obama birth records, including paper, microfilm and electronic records to eliminate the possibility that a forger or forgers may have tampered with the birth records. The sheriff also said that Obama needs to authorize Kapi’olani Hospital to release any medical records that it may have on Stanley Ann Dunham Obama, his mother, and for the newly born Barack Obama, to provide corroboration for the records held in the Hawaii Department of Health vault. Only with “authentic Hawaii Department of Health 1961 birth records for Barack Obama” can we reasonably concluded that Obama was born in Hawaii as he claims, Zullo said. The investigators have also concluded that Obama's Selective Service card was most likely a forgery, revealed by an examination of the postal date stamp on the document. Additionally, records of Immigration and Naturalization Service cards filled out by airplane passengers arriving on international flights originating outside the United States in the month of August 1961, examined at the National Archives in Washington, D.C., are missing records for the week of President Obama's birth, including the dates Aug. 1, 1961 through Aug. 7, 1961. Among the evidence released at the press conference are five videos which demonstrate why the Obama long-form birth certificate is suspected to be a computer-generated forgery. In these videos, Sheriff Joe Arpaio presents the results of his investigation. He has also produced a sixth video which show that by examining the postal date stamp on the document the posse has concluded that President Obama's Selective Service card is most likely a forgery. “That we were able to cast reasonable suspicions on the authenticity of the registrar stamps was especially disturbing, since these stamp imprints are designed to provide government authentication to the document itself,” Zullo said. He stressed that if the registrar stamps are forgeries, the document itself is likely a forgery. With “probable cause” having been established that crimes have been committed, Sheriff Arpaio has concluded that a criminal investigation is warranted. He asked that any other law enforcement agency with information referencing this investigation be forwarded to his office. He has also added that greater scrutiny of presidential candidates is needed. For more information, see http://www.wnd.com/2012/03/sheriff-joes-posse-probable-cause-obama-certificate-a-fraud/ and http://nation.foxnews.com/sheriff-joe-arpaio/2012/03/01/sheriff-joe-arpaio-obama-birth-certificate-forgery. CBS Television coverage of Sheriff Arpaio’s investigation and press conference can be seen here http://www.youtube.com/watch?v=ikaajbOEWpk&feature=player_embedded. None of the above 40 factors alone would be sufficient to disprove that Obama was born in Hawaii. But the totality of them raises more than legitimate doubts. What is now most disturbing is Sheriff Arpaio's Cold Case Posse has now concluded based on its 6-month investigation that there exists "probable cause" that Obama's alleged April 27, 2011 birth certificate and his Selective Service Registration are forgeries. With the "probable cause" developed by Sheriff Arpaio's posse, Congress should definitely step in and conduct a full investigation, using the full force of its resources and subpoena powers. Needless to say, Congress should compel Obama to dispel this evidence by providing corroborating evidence supporting his claim that he was born in Hawaii. That evidence must be more than just posting in April 27, 2011 a computer image on the internet of an alleged Certificate of Live Birth. One would think that the Obama camp and all those who support him would mount an all-out attack and present all the evidence that proves Obama was born in Hawaii. What is important to ponder is that after almost two years of public trashing of the Obama birthplace issue, the 2008 alleged electronic on-line image of an alleged 2007 Certification of Live Birth (a COLB which is not a Certificate of Live Birth that contains the name of the birth hospital and delivery doctor), the two 1961 newspaper announcements, what some Hawaii officials say in 2009 and 2010, and an April 2011 electronic image of an alleged Certificate of Live Birth is the only evidence provided by our nation’s editors and political leaders on the question of where Obama was born. So let us review. What evidence do we currently have which sufficiently proves where Obama was born? We have an unconfirmed 2008 computer image on the internet of an inconclusive COLB which some experts maintain is a forgery, two unsubstantiated 1961 newspaper announcements (which were placed in those paper automatically by the health bureau statistics office, not the family, after someone filed a registration of birth form) which do not tell us the source of the birth information stated therein, some hearsay statements made by Hawaii officials in 2009 and 2010 which all together and by themselves do not conclusively prove that Obama was born in Hawaii, and a computer image of a Certificate of Live Birth which Sheriff Arpaio's posse has shown is a forgery. What makes matters worse is that these same leaders have not taken Obama to task for his hiding his personal papers from the American public (original certified true paper copy of his 1961 birth certificate and travel, work, and education documents). That is a lot to think about. What ever happened to America’s intelligence? The manner in which our nation’s leaders have addressed the Obama birthplace issue is shocking given that we are supposed to be concerned with properly vetting and identifying the to-be President of the United States and Commander in Chief of the Military before we entrust him or her with the survival and preservation of our nation and the free world. It is Obama who chose to run for President and who is now running for a second term. We cannot imagine that he does not realize that he has no reasonable expectation of privacy as to his place of birth and as to what he has done in his life. Regardless of where Obama was born, he has lost what he probably perceives to be nothing more than a little birth certificate game given that he has disrespected so many Americans who have every right to know who their President is. Obama is supposed to be a constitutional scholar. Maybe he never learned or he forgot that the President works for and answers to the people who under our Constitutional Republic are the sovereigns. Obama’s refusal to provide basic credible information showing where he was born, posting on the White House server a forged birth certificate, and posting on the internet a forged Selective Service Registration can only leave us thinking what is truly happening in America. And also in this recent story: http://abcnews.go.com/Politics/puerto-rico-birth-certificate-crisis-invalidating-fix/story?id=10422841.